New figures from the Central Statistics Office show that the rate of unemployment fell to 5.6% in February, from the revised rate of 5.7% in January. Unemployment had stood at 5.8% in February 2018. The CSO said the seasonally adjusted number of people who were unemployed stood at 135,100 in February, down from 136,800 in January. Today's figures reveal that the seasonally adjusted unemployment rate for men was 5.6%, unchanged from January and down from 5.9% in February 2018. Meanwhile, the seasonally adjusted unemployment rate for women was 5.6%, down 0.1% from January and down from 5.7% the same time last year. The CSO also said the seasonally adjusted youth unemployment rate eased to 13.8% in February, from 13.9% the month before. It recently revised the January jobless rate up to 5.7% from an initial estimate of 5.3%. Monthly unemployment rates have been subject to this kind of revisions in recent quarters. Unemployment has fallen steadily since peaking at 16% in 2012 when the country was in the middle of a three-year international bailout. The jobless rate here is also just over two percentage points below the current euro zone average of 7.8%. The largest rates of increase were recorded in the administration and support service activities with growth of 12.6%, while construction sector jobs rose by 7.9%. 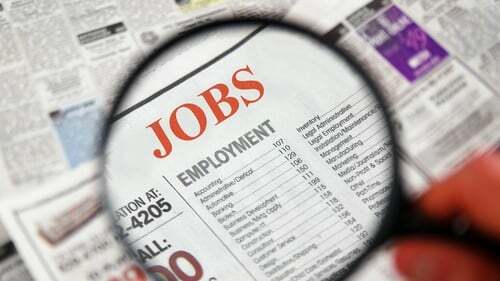 Commenting on today's figures, Merrion economist Alan McQuaid said that the rise in employment appears far from over. He said there was an average net jobs rise of 63,400 in 2018, while a net jobs gain of 50,000 is forecast for 2019. "Meanwhile, the average jobless rate was 5.8% in 2018, down from 6.7% in 2017. A further fall, to 5.5%, is envisaged for this year," he added.